Documentary photographer, Robert Shults, went from being a homeless dreamer to a home-owning artist after taking photos of the brightest light source in the known universe, a laser in the basement of the physics department at The University of Texas. The Superlative Light is an uplifting story of an artist's journey from obscurity to prominence and the photographs he made along the way. Ben Steinbauer is a filmmaker who made his feature directing debut with the award-winning comedy documentary, Winnebago Man, which was released theatrically in 2010. Michael Moore called it “One of the funniest documentaries ever made!” and Roger Ebert named it one of his favorite documentaries of 2010. 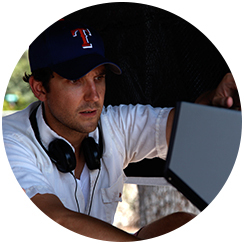 Steinbauer was named by Texas Monthly as one of Texas’ directors to watch, holds a masters degree from the University of Texas and is the recipient of the Princess Grace Foundation Award for Filmmaking. He is co-owner of the Austin based, Emmy award-winning production company, The Bear, and has directed commercials for clients including Dell, Popeyes, Shiner and YETI. A film that Director Ben Steinbauer considers a labor love with a supportive crew behind it, “The Superlative Light” illustrates the journey of Robert Shults. From homeless man to praised photographer, Shults’ story embodies strength and the will to carry on no matter how often life’s obstacles stand in the way. PBS: How did you first learn of Robert Shults? BEN STEINBAUER: Well I was looking at the Austin Chronicle, which is our local, free paper here, and I was reading the section about a photography show that was closing that evening. It said that they were photographs of the brightest light in the known universe. I couldn’t make it to the art show, but the brightest light in the universe is from Austin, Texas? How did I not know about this? So I Googled the laser, and I found the page for the university for the physics department outlining the laser. It describes what it does, and very quickly I was totally out of my element. It’s really complicated what this laser does, and what I was really struck with was the fact that it was the brightest light in the known universe that was here, you know, less than a mile from where I live. So I knew I wanted to do something with that bit of information, and it felt like the laser was hard for me to comprehend or hard to spin a story around, so I went back to the photographs that Robert took of this laser, which is really how I got to know about the laser in the first place. The photos were gorgeous high contrast, black and white photographs. They looked like something almost out of a science fiction film that I hadn’t seen but really wanted to, you know? It made the scientists look like these daring adventurers. It was just totally fascinating. And so I was like “who is this guy?” and started looking into Robert’s backstory and reached out to him through his website and we met for coffee. I had learned from reading about him that he had been homeless, and so at our first meeting, he mentioned that he and his wife were buying their first house. And I thought, well that’s something that I could film right away that’s happening right now, and this is a neat little character arc from going from homeless to home owning. So, that’s really how the project started. PBS: As you mentioned, a large part of this film plays on light and the audience listens to Robert as he discusses what it was like to photograph this laser. How did light play a role — or did you feel it was something you took into consideration — in the way you filmed? BEN: Absolutely. The part that came into the practical challenge of light was that the brightest light in the universe was something you can’t see with your eyes, and it’s not able to be photographed. So it was a real challenge in how to just conceptualize how to photograph it, and that’s why Rob’s photos are so stark and stylish, because he was really working within the confines of this laboratory. So we knew we wanted the laser to be part of the story, but also knew that if we took cameras in there that there was a potential for damaging or destroying them, so we basically had a really talented DP and grip and electric crew that was able to come in and get what the laser theoretically looks like when it fires in a way that was safe to film. So we spent hours lighting the laser in the physics department of UT in order to basically get this pulsing light effect, which is what really happens when the laser’s on. So that’s a practical problem we dealt with. But then, just sort of artistically and aesthetically, I knew that I wanted light to be a big part of it, so we were always looking for how we could incorporate lens flares or practical lights, like that scene in the bathroom where he’s looking up at the light fixture. Basically we’re constantly thinking about light and the motif of light all the way through every shot, every moment of the color correction, even in the sound mix, we did things to really sweep moments where the light is pulsing, or he’s looking at the lights. So that was visually our rule and aesthetic we set for ourselves to follow. PBS: What was it like to hear of Robert’s strength and his decision to fix his problems on his own without the help of his family? BEN: To me, that decision that Robert makes in that moment is what I find most fascinating about this story, because I think that’s a choice that not everybody would have made, and it was a very strong and strange character defining moment, and it’s one that I admire very much. But what I found as we were sharing the story with people, whether that was in pre-production, edit or during production, I found that some people have a problem empathizing with that, because if he had the opportunity to get help then he should’ve used that opportunity and not subjected himself to being homeless. I totally understand the reading of that, but I view that as a daring choice that he made that affected the rest of his career trajectory. He was really willing to put it all on the line. And you hear artists say that — that you have to devote yourself totally to your craft. You have to do whatever it takes to make your next film or your first record or whatever the case may be, and I think in this particular instance that is a really dramatic version of that story. It’s one that I really admired and I don’t think a lot of people would have made a similar choice. I guess I’m trying to think for myself why I empathize. To me it felt like a strength, not a weakness, that he had the ability to ask for help and get off the street and he chose not to take it. I think that that’s admirable and it speaks to his stick-to-it attitude, and that bleeds over into his career. He took photos of the laser for over a year and basically became friends with the entire staff of the physics department and was around there every day as long as he felt he needed to capture what he saw in his mind. So someone who has that level of determination is going to have a strong level of work, and I think that his decision to remain homeless rather than admit defeat is an illustration of the doggedness and self-confidence and work ethic. I just really admire him for doing that. PBS: How do you choose the music to fit the photographs? BEN: We worked with this really talented composer and friend of ours, Curtis Heath. He is one of those guys who can play just about any instrument and has a sensitivity and brings a storyteller’s ear or logic to every piece of music he creates. In this film I wanted something that basically sounded like being outdoors, because one thing that Rob told me early on is that when you’re homeless, there’s never just quiet. There’s never a time where you can go into a room by yourself and close the door, and that that was one of the hardest things, and I think that the point is that being homeless makes people mentally ill, not necessarily the other way around. The lack privacy and the constant noise is something that we talked about over and over and over, so that scene under the bridge where there are cars coming over — we used that in the score and we tried to have moments of the music swelling to the point where you just can’t take it anymore, then we cut and go into another scene. So we were just trying to tease out these moments that were in the narrative that were hitting that theme and were driving it home as much as possible. PBS: There’s definitely a stigma surrounding the homeless. As Robert mentioned in the film, there are people out there who view the homeless as either mentally ill or as substance abusers. How do you hope society’s views change? BEN: To be honest I don’t think I’ve put a lot of thought into that because I don’t consider myself a social issues filmmaker. I like telling stories of strong characters that become emblematic of larger topics. I really believe that the more personal your story is, the more universal it becomes to an audience. So I think in this case, Robert’s personal experience becomes a story about homelessness but really at the heart is just the story of Rob. I guess the way that it’s changed for me, you know when I see a homeless person now, I think about Rob’s story and I try to imagine the circumstances that led this person to go so far as to be sleeping outside under a bridge, not having a home and not just immediately discount or blame them for that outcome. Or even just talking to them, you know I’ll roll down my window and just talk to them, and it doesn’t even have to be a real meaningful interaction, it’s just acknowledging that they’re there. “The Superlative Light” was shot in both 2D and virtual reality with the help of Dox.